CFM354 is a 1938 Leyland Titan TD5 with an Eastern Coachworks body, and carries fleet number M52, the M prefix identifying it as a Leyland Titan. In 1942 Crosville came under full Tilling control, a move which was to change to a green livery and enforced the purchase of Bristols. M52 was withdrawn and sold in March 1958 to Contract Bus Services, a firm which specialised in supplying buses for works and construction site contracts. M52 is known to have been used at the Llanwern steelworks near Newport. After withdrawal from these duties in 1962 it was sold to Wray’s scrapyard in Cardiff. Way was one of a number of scrap dealers with a tendency to hoard vehicles. Thus M52 was to survive in Wrays yard for the next 10 years until purchased for preservation by its present owner Harold Peers in January 1972. Bradford 410 is an AEC RT built in 1947 originally for London Transport (RT172), where it worked until March 1958, when it was disposed of to Birds Commercial Motors, based near Stratford-upon-Avon who then sold it to Bradford where it quickly re-entered service in little altered condition apart from a new blue livery. In 1968 after 10 years service from Ludlam Street Depot, it was sold directly into preservation and has been restored it to a typical condition when operating in Bradford. 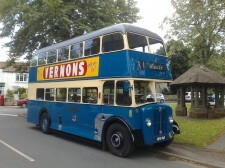 This bus is believed to be the oldest surviving post-war RT- type bus. It has the early style of body with a narrow destination layout and a roof box for the route number. After the sad loss to the group of member Keith Leighton who owned Bradford 410 the vehicle has been purchased by Alex Lawson, Greg Lawson and David Hudson. Bradford 82 is an AEC Regent III built in 1952, and was one of a batch of 40 similar vehicles, with an East Lancs body fitted with Birmingham pattern “new look” enclosed radiator fronts. She is fitted with an AEC 6-cylinder direct injection diesel engine, fluid flywheel and pre-selector 4-speed gearbox. On withdrawal in 1972, she was converted to a mobile generator, lasting until 1974 when she was sold to Sandtoft Transport Centre where its engine was used to generate power for the overhead wires. In 1981, 82 was converted for use as a mess room/ sleeping quarters for the British Trolleybus Society. It was purchased in 1992 for preservation by Jim Speed and Darren Hunt and presented a major challenge. All internal fittings had been lost as had the engine, gearbox, radiator, differential and propshaft, along with 3 chassis cross-members and various other components. Bradford 82 made its rally debut at Sandtoft in 1994. She is now owned by Greg Lawson and attends many shows and rallies. KNV337 was built in 1954 by Bristol commercial vehicles of Brislington, and has a lowbridge body built by Eastern coachworks of Lowerstoft, it has rare staggered seating on the upper deck this being designed by West Yorkshire Road Car. 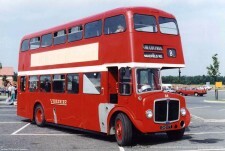 KNV337 was delivered to United Counties Omnibus Company Limited, Northampton in 1954 where it was in service until being converted to a driver training vehicle. It was withdrawn in July 1972 being sold straight out of service to Graham Ledger from Northampton. It was sold to Roger Burdett in November 2013 and is now on long term loan to Greg Lawson and attends many rallies and shows. Bus services in the Heavy Woollen towns were provided by Yorkshire Woollen District Transport Co, based at garages in Dewsbury, Heckmondwike and Liversedge. The company had used a maroon and cream livery until 1953, but in that year as a result of spray painting, an all over red livery was introduced. DHD177 was delivered in 1957 and being withdrawn in October 1971 and being sold to North’s, the Sherburn-in-Elmnet dealers. DHD177 has enjoyed a varied career since and is now in its second spell of preservation. Initially sold in September 1972 to Lincolnshire operator, Peter Sheffield of Cleethorpes, with whom it served for 6 years. It was first bought for preservation in December 1978 by the 797 Preservation Group in Batley but was later sold to Darlington based driver training school Drivewell. 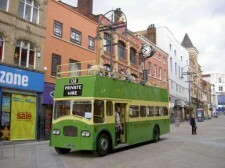 In January 1991 it returned to preservation in Dewsbury and was secured by its present owner Simon Turner in October 1997. 574 CNW was delivered to Leeds City Transport in 1962 as one of a batch of six vehicles which were unusual at the time for LCT as they were Daimler CVG6 with front entrance 70 seat bodywork by Charles H Roe. Up to this date Leeds had always ordered rear entrance bodywork, believing, like London Transport, that backloaders were quicker loading than some of the high seating capacity rear engined vehicles that were by this time available on the market. These vehicles were, however, bought with a specific purpose in mind, in that they were put to use on the Leeds - Bradford service to complement the AEC Regent Vs used by Bradford Corporation. This they continued to do until the route was given over to rear engined double deckers once LCT had become convinced of the latter''s superiority as they could be single manned. They were then used on other routes still conductor operated. After the formation of the West Yorkshire PTE in 1974, they were drafted in to other areas and, by withdrawal, were the only vehicles from the former constituents of the PTE to have operated in all four areas of the PTE. 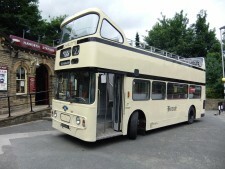 Upon withdrawal 574 CNW, along with its sister 572, were converted into exhibition buses for West Yorkshire County Council, serving to publicise a wide variety of services. 574 was last used as a "Peace Bus". 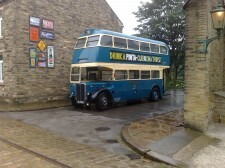 Upon the establishment of the West Yorkshire Transport Museum project. 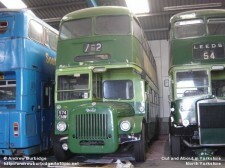 both vehicles were presented to the museum, where 572 continued in use as an exhibition bus, whilst 574 was despatched to Thornbury Works for restoration as a bus. This work was not fully completed as de-regulation led to the closure of the works before the job could be completed. 574 then stayed with the project until purchased by David Crowther of Classic Coaches, where it stayed until this business went into administration.It then passed to the ownership of Malcolm King,a former LCT employee, before being purchased by Warren McClintock. Since the purchase of 8534 by Warren. Copyright Aire Valley Transport Group 2019©. All Rights Reserved.